Amidst the all high-tech computer games,purchased or hired, that surrounds our society, partying outdoor with a giant water slide is still remains to be among top fun party booster. On a nice sunny day, nothing beats the feeling being outdoor with the whole family and friends getting that long awaited, computer-free fair dinkum fun. Guests and family friends don’t even have to wear any formal clothes at all, not need to practice for any presentation for a special event or the usual extensive party preparation. 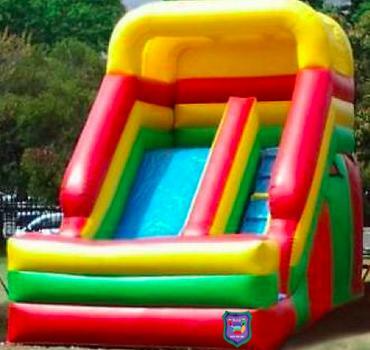 All the needs to be done is to call a reputable party hire company and have the water slide delivered to the venue of your choice. If you ask me, I wouldn’t contemplate of buying a giant water slide , not just for the cost involve. You see, when you hire this party equipment, not only will the hire company set it up for you, they will even offer to supervise the kids if you think you’ll be too busy to entertain other guests or doing some cooking. What more, after your party or even, they will tidy up the water slide where some party hire company will even let you clean the giant water slide before they pick it up. Just looking at the size of it, one can easily tell how much work and hours you’ll have to spend just by cleaning this party equipment. So when thinking of a giant water slide, it’s always best to hire than to buy. Besides, it just makes your day a lot easier rather than thinking about the work of cleaning the giant slide while having fun. So there you have it…… an outdoor , stress-free party with a giant water slide from a reputable party hire company to have that long-deserved epic fun for the whole family.